Egyptian strongman Gen. Abdul-Fattah el-Sisi is using the brutal repression of the Muslim Brotherhood to consolidate his grip on power, overshadowing the military-appointed civilian government and a commission charged with drafting a new constitution. The military’s ouster of former President Mohamed Morsi in early July has rehabilitated the image of the armed forces, which governed Egypt directly through the Supreme Council of the Armed Forces (SCAF) for 18 months following the February 2011 downfall of Hosni Mubarak. Morsi and the Muslim Brotherhood were able to win elections for the country’s parliament and then the presidency. But Morsi’s grab for all political power and his pro-market economic policies gave rise to the Tamarod (Rebellion) movement this year, which gathered 22 million signatures calling for Morsi to resign and led to a massive day of protest on June 30. The military stepped in to force out Morsi, promising new elections, but it moved in aggressive fashion against the Brotherhood. The head of the army and also Defense Minister, el-Sisi portrays himself as new Gamal Abdel Nasser–Egypt’s nationalist leader in the 1950s and ’60s. He justifies the July 3 coup against Morsi and the subsequent massacres of Morsi supporters as a necessary defense of the country’s secular traditions against Islamism. Mostafa Ali, an activist with the Revolutionary Socialists, explained to Lee Sustar how the armed forces diverted the growing mass movement against Morsi into support for a counterrevolutionary crackdown–and why Egypt’s military rulers, while popular for now, have no intention of satisfying the economic and social demands of the Egyptian people. WHY DID the military move against the Muslim Brotherhood so forcefully? After all, the constitution authored mainly by the Brotherhood actually consolidated the military’s economic and political power. Wasn’t some kind of arrangement possible? THERE ARE two reasons. First, the old state apparatus was never really dismantled after the January 25 revolution. By the state apparatus, I mean the upper echelons of the army, the police and the state bureaucracy. They couldn’t accept that the people they repressed and stepped on for 30 years or so–that is, the Muslim Brotherhood–could become full partners in power. The state bureaucracy did everything it could to prevent Morsi and the Muslim Brotherhood from playing any sort of an effective role in governing. I can give you one example. Egypt was marred by an unbelievable crisis, a shortage of gasoline. You had lines stretching for kilometers of people searching for gas. This went on for months before the ouster of Morsi. They disappeared immediately the day that Morsi fell. The state bureaucracy was actually sabotaging the attempt of the Brotherhood to run the government or the state machinery. The second reason, which is more important, is that the army was counting the Brotherhood to be a political front to manage mass popular anger. But the Brotherhood committed mistake after mistake, increasing the level of public anger on the ground with its continuation of neoliberal policies–or you can call them impoverishment policies–for the mass of the population. In the end, the army reached the conclusion that the Brotherhood had failed in carrying out its assignment–in carrying out the role or task they were granted. The Muslim Brotherhood could not contain public anger. They were actually increasing it by refusing to even make very simple concessions to the working class and to the poor. For example, they rationed bread–the main staple in the country, something unheard of under Mubarak. So while the state machinery sabotaged any attempt by the Brotherhood to become full partners in ruling Egypt, the Brotherhood insisted on continuing Mubarak’s social policies, thus increasing popular anger. The army decided that the Brotherhood could no longer be at the front of the political scene. THE ARMY’S seizure of power and the crackdown on the Muslim Brotherhood has led some to conclude that the June 30 mass protest was simply a cover for a military coup. THE TAMAROD movement was a genuine popular attempt at building opposition to the Muslim Brotherhood. We knew that the Mukhabarat, the secret police, jumped on the Tamarod movement, as well as elements of the former Mubarak regime. But even though this was the case, at the end of the day, June 30 was a genuine popular movement against the attempts of the Brotherhood to enforce a dictatorial regime. This is a ruling class that wanted to use the Muslim Brotherhood to defeat the revolution. When they came to the realization that the Muslim Brotherhood was not effective enough, they decided to do it a different way. Unfortunately, the Tamarod movement, as genuine as it was, as honest as it was, was used by the military not only to get rid of the Muslim Brotherhood, but also to launch a complete counterattack on the January 25 revolution. This is why the picture is quite complex. You had a genuine wave in the revolutionary movement that was coopted and pushed in a completely different direction by the military in order to end the revolution. 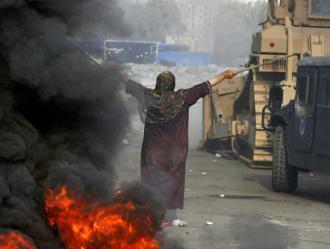 People in the West should understand that the Egyptian revolution and the Arab Spring face a very difficult challenge. The counterrevolution is in full force. People should realize that the Muslim Brotherhood betrayed the revolution. But that betrayal of the revolution was not the same as the old ruling class attempting to defeat the entire revolution. This is really the difficult question facing us here in Egypt. We cannot equate the crimes of the Brotherhood and the crimes of the ruling class. So while we publicize the crimes by the police and the army and their massacres of the Brotherhood’s supporters, we’ve always been against the Brotherhood because they fronted for the old ruling class. The main enemy is the state, and it’s always the state. WHAT DOES it mean that the military was able to move against the Muslim Brotherhood right now? IT IS a mark of absolute confidence. They have a popular mandate to crush the Muslim Brotherhood. Along with this is an attempt to vilify anyone who stands up against the massacres that took place against Brotherhood protests in the middle of August. Certainly the Brotherhood while in power continued the SCAF’s attacks on the revolutionaries. But the Brotherhood could not, at the end of the day, kill more than one or two dozen people–of course, with the help of the Ministry of the Interior. In a year in power, the Brotherhood did not carry out 1 percent of the repressive policies that the armed forces has done in a matter of weeks. The numbers killed are astounding. We have verified almost 1,700 dead in the span of three days between August 14 and 17 after the security forces violently dispersed Brotherhood sit-ins. According to a number of human rights organizations, the dispersal of the Islamists’ sit-ins is the biggest massacre in the history of the modern Egyptian state. It is unprecedented. AND YET the army remains widely popular among the population as a whole. Why is that? TWO REASONS. One is that the Brotherhood was actually quite frightening during its year in power. They’ve given people every reason to believe that they will be oppressive on all sorts of levels, that they will continue economic policies against the poor, and that they were about to build a dictatorship. People were generally scared of what the Brotherhood was doing. The second reason is that the army and the ruling class have carried out a successful campaign of demonizing the Brotherhood. They have convinced many, many people, including those who genuinely opposed the SCAF’s rule, that army rule is the lesser of two evils to the Brotherhood. This is really the main argument. Unfortunately, many revolutionaries have accepted this argument. They have on principle opposed SCAF rule, military fascism and military dictatorship. But they say that the army is the lesser of two evils, compared to what they call religious fascism. So that’s why we find ourselves in this precarious situation. Many revolutionaries see what’s happened in the last few weeks as an unstoppable process, heading toward a military fascism. But I don’t share that opinion. There are many signs of a possible military fascism. However, the situation on the ground is really quite complex and filled with contradictions. For example, the army cannot continuously ask its soldiers and officers to shoot at the Brotherhood. In the last few weeks, there has been hysteria and demonization of the Brotherhood. The message was that you can kill as many of the Brotherhood people as you want, and it’s fine–it’s a national duty. I don’t think this process will continue. There have been a few cases of officers refusing to open fire, both among the police and within the army. The army says formally and publicly that it has no intention of ruling, that it has no intention of pushing Egypt to become a militarized state. It promises that it will disappear from the political scene as soon as a constitution is in place and elections are held. That resonates with a lot of people. So what happens when the army doesn’t disappear. Also, the army is under tremendous pressure to deliver to workers on an economic level. One of the main reasons Morsi was rejected by the majority of working class and poor people was that he was not able to deliver on the demands of the revolution: political justice, economic justice, social justice and so on. So the army is in a difficult position. WHAT WILL el-Sisi’s foreign policy be like? There is a lot of America-bashing coming from the regime, right now–ironically, given the close ties of the military to the U.S. in the past, before Mubarak fell. THE MAIN public discourse that justifies support for el-Sisi is that he’s a new Nasser–that he’s a neo-anti-imperialist. So the government has come out against possible U.S. or British intervention in Syria and said it would not participate in any U.S.-led attacks, unlike its participation in the two Gulf Wars against Iraq in 1991 and 2003. As a result, some people are expecting that there will be reconfiguration of the Egyptian army’s alliances internationally. There are calls by the right wing to drop the army’s tutelage by the U.S. and to rely more on China and Russia. Both countries have expressed publicly their willingness to become military suppliers to the Egyptian army. That’s actually just smoke and mirrors. The Egyptian armed forces are systematically, and on principle, tied to the project of U.S. imperialism in the Middle East, and will never break with that. There is no Russia option, there is no China option. Whatever disagreements exist at the moment between the Egyptian army and its masters in Washington are temporary. The U.S. will come back full circle to stand behind the Egyptian generals, and the Saudis have made it clear to the Americans that this is the best setup. So while the government can talk about a Zionist-Turkish-American conspiracy, they have no intention of repealing the Camp David agreement with Israel. In fact, the government is carrying out a “war on terrorism” against jihadists in the Sinai region with the full permission of Israel. Israel is 100 percent behind the current Egyptian government. In the Israelis’ opinion, this is the government that could put an end to the Egyptian revolution. So despite all the talk about Zionism, the real targets of the xenophobia have been Palestinian and Syrian refugees in Egypt. Because a few Syrians showed up in some Morsi protests, and because Morsi and the Brotherhood supported the Syrian revolution, there’s been a disgusting backlash against refugees in Egypt. There are 250,000 Syrian refugees, and of course Palestinian refugees have been here for decades. It’s a very unfortunate situation. The government has arrested many Syrian refugees, including children. That’s something that revolutionaries and human rights activists are fighting against. There’s also been a setback–and this was fomented by the right wing–for popular support for the Palestinian struggle against Israel. Unfortunately, Hamas, which was the Brotherhood’s ally, has been associated with all Palestinians. We in the Revolutionary Socialists have been involved in campaigns against the detention of Palestinian and Syrian refugees. WHAT WILL be the political shape of this new regime? POLITICAL DISCUSSION now is not about elections but a new constitution. Everything is in flux. It’s hard to even ponder the elections. But they’re trying to push a new constitution through. There are many reports that government is already working on a compromise with the Brotherhood. It’s significant the other big Islamist party, the Salafist Nour Party, is supporting the government. They are betting on winning as many as possible from disgruntled members of the Muslim Brotherhood, because they’ve always been smaller in comparison. On the other hand, the regime needs an Islamist party to be part of a new setup. This isn’t simply because it doesn’t want to be accused of being anti-Islamist. They actually need the reactionary and conservative politics of the Islamists to remain a vital part of Egyptian political life. That’s why they need the Nour party–so long as it’s under their control. WHAT ARE the prospects for a renewal of the revolutionary movement? I WANT to stress that despite all the signs of an impending military dictatorship or military fascism, it isn’t a smooth walk for the military, nor will it become one. Because underneath all the xenophobia, the nationalist hysteria, the incredible support for the army, you have a population that rejected the Brotherhood for specific social and economic reasons, and that wants a redistribution of wealth. It is now waiting for dividends–economic dividends. This is a population that wants reforms–economic reforms in the shape of a redistribution of wealth. For now, money from the Saudis, the Kuwaitis and the Emirates have beefed up the national currency reserves and given the government some room to breathe. They can postpone any decision about taking loans from the International Monetary Fund and market “reforms” for a few months. But you can already see that the new money is not being used to appease the popular demand for a reversal of the Brotherhood’s economic policies–and, for that matter, Mubarak’s economic policies. You can see that from the textile strike in Mahalla on August 28. The government has plenty of money, but it has shown no intention so far of carrying out Keynesian policies to raise workers’ incomes. On the contrary, we are seeing trickle-down economics, a la Milton Friedman. The strike shows that the government is not willing to use the money coming from the Saudis, to calm workers down. So it’s a very complex situation. Posted on September 6, 2013, in North Africa and tagged Egypt, Egyptian Revolution, Muslim Brotherhood, SCAF. Bookmark the permalink. Leave a comment.